Paula is inarguably a ’Jill-of-all-trades’. Originally from Nova Scotia, Paula has been involved in the veterinary industry for many years. She has worked as a animal health assistant, receptionist, and clinic manager and has been highly regarded by her co-workers and employers in each of those roles. In a past life, Paula was an Environmental Scientist in the oil and gas industry working in Alberta and offshore Nova Scotia fields. Paula is well known as a competitor in agility and as a local dog trainer. She also co-owns a pet-supply business, ’Hairy Barkers’, and can be found at most dog shows in her booth or in the agility ring. We first knew Paula at the Canine Fitness Centre as a client when her Belgian Shepherd had neck surgery and then her other had knee surgery. 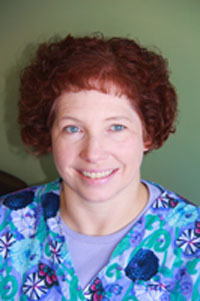 In 2011 brought her on board to our management team in order to help with the growth of the clinic. When not working, working, or working… Paula enjoys time with her husband and furry family members, currently three rescue mix-breed dogs.